My name is Des Cox and, together with my wife Ulla, we founded Snowbow Productions (2000) Ltd. over twenty years ago. Our intention was to provide a service to anyone who had a maritime interest. Our emphasis focused on the history of 20th century shipping and the need to somehow create a ‘lasting moving image record’ of the heyday of shipping at a time when we could boast of having the biggest and best merchant service and shipping industry in the world. I went away to sea at the age of 16 fresh out of Sea Train School and, without spending hours writing of my sea-going days here, I can say beyond a shadow of a doubt that, no matter what else I have done in life, those days serving at sea were the best years of my life. When I left the sea, I went into show business, and became a contract artist with EMI Records in the early 1960s. I found myself in the same stable as The Beatles and other internationally famous music stars. I performed all over the world in cabarets and concerts as well as on TV and Radio. I went on to co-star in the original version of the top rated televisions series, ‘Candid Camera’ as well as performing solo in night clubs as a stand-up comedian. Strangely, all of this was not so dissimilar to the life I had known at sea, which was also full of excitement, adventure, romance, change and uncertainty. I won’t dwell on my career save to say that I went on to write, starting with that most famous of all comedy set-ups ‘The Goon Show’, as well as my own children’s stories. This led onto writing, producing and directing everything from children’s TV through to some of the world’s top rock/ pop programmes. I have also lectured on shipping and entertained both in shore locations and aboard modern day cruise ships. My experiences all put me in the unique position of not only knowing how to make video and radio programmes, but also, because of my years at sea and as a maritime lecturer, able to make quality video programmes on shipping, which has in turn allowed us to create our award winning video series entitled ‘The Great Liners’. Today, we are without doubt, the world leaders in what we do. Work that, up until now, covers badly neglected interests. The end result has been that we can now boast of having created, not only the biggest maritime film and sound archive in the world, but also becoming the world’s leader in the production and distribution of well over forty maritime themed DVDs (with more still in production). These DVDs not only enable all interested people to be able to see and experience just what it was like to have been alive in those halcyon maritime days, but to also give the world the most comprehensive film coverage of those wonderful times. In fact its true to say that practically every shipping company of the 20th Century, from the mightiest to the smallest, and all their magnificent ships (large or small) are to be found in this series. So whatever your specific or general interests are, you will almost certainly find them featured here. We also represent the great maritime artist, Robert G. Lloyd, with whom we have worked closely to bring you the world’s greatest collection of fine art maritime prints, made to the highest standards and, as with the DVDs, cover hundreds of different ships from the earliest to the very newest, all of which you will find on this wonderful maritime website. I could write a book just about the things we do, which incidentally, we do just for you, because we were so concerned that if we didn’t then no one else would, and if that happened then there would hardly be anything to satisfy our maritime interests and concerns. What else do we do? Well we operate special cruises (we really prefer to call them, ‘Voyages’) where we turn back the hands of time to experience going away to sea as we used to be able to do in the good old days… Instead of enormous floating blocks of flats that seem to spend almost every available moment in one-port or another, we have found smaller more conventional ships, where our days spent at sea are by choice. So as well as being of a size that allows us to call into places too small for those larger ships, we can also enjoy being at sea without all the noise and endless queues and, importantly, just relaxing on wide open decks calmly drifting to the soothing sounds of the passing ships wake, or witnessing the most spectacular sunsets and if you’re a night bird, to see the magic of the ocean’s starry skies at night. 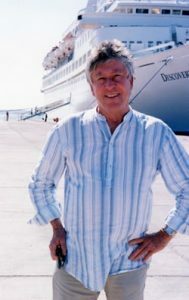 If you’d like us to keep you up to date with the latest information on these special maritime memories cruises and any new interests such as books or new DVDs, please feel free to sign up to our occasional newsletters or, if you have any questions, then please feel free to either email or call us. People are always asking just what motivated me to undertake the huge task of creating a lasting, moving image record of the golden age of shipping and the great days of the British Merchant Navy. The short answer is because I was so privileged to be part of it; a way of life that would be etched in my mind for life and change forever my attitude to all. 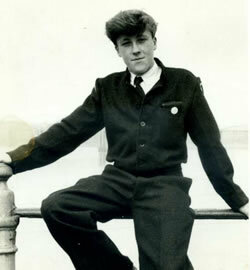 Like so many young boys in the UK I went to sea when I was 16, at a time when travel overseas was only for the rich and famous. I will never forget the exhilarating moment when I first gained sight of London’s once great Royal Docks from the top of an old London Transport trolley bus as it rumbled through the clinging fog of a 1950s winter morn. My eyes stared in awe at the exhilarating sight before me; the almost endless display of ships, lined up against the quays for almost as far as the eye could see, their famous floodlit funnels looming out of dockland’s darkness as if creatures from another world. Blue Star, New Zealand Shipping Co, Federal Steam, Ben Line, Glen Line, Shaw Savill, Ellerman Lines, Harrison’s, Blue Funnel, American Lines, British India, P&O, Brocklebank, Union-Castle, Bank Line, Port Line, United States Lines, Elders & Fyffe’s, Royal Mail, Cunard, to name but just a few. Everyone who ever went to sea has his or her very own very special story to tell. Sadly, most of these stories will never be properly told and become lost in time, which is one of the main reasons why I have spent the past twenty-years producing this unique series. The long forgotten reels of 8, 9.5, 16 or 35mm film have come to us over the years after being found in such places as old disused offices, factories, garden sheds and attics, with many dating right back to the earliest days of film, to Titanic and beyond. Often they would include extremely dangerous cellulose nitrate films and negatives, so volatile that even exposure to the air could cause them to burst into flames. 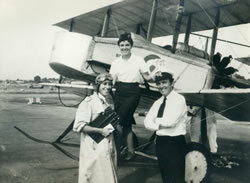 Some were considered to be in such disrepair and dangerous that even the British Film Institute refused to touch them. That meant if we ever wanted to see the precious images hidden within their decay, I had little option but to try to restore them myself, a task that sometimes would take a whole year just to dissect, repair and restore one film to its original condition before copying, and in doing so, saving their glory for the whole nation, the world, and for future generations to enjoy. Everyone who ever had any involvement with ships has stories to tell and here I have been able to tell just a little of mine. That’s why I have produced this remarkable series – it’s a memorial to an age that I, and so many others, will never forget; the age of ‘The Great Liners’. To tell the truth, I also really wanted to experience once again the freedom of ocean travel so many of us enjoyed back in those halcyon days. Whether that be as a passenger or crew on a leisurely line voyage or an unhurried queue-less and relaxing cruise. Maybe even enjoy the true freedom, excitement and adventurous way of life to be found serving aboard almost any of the hundreds of cargo ships. All so far removed from most of today’s sea-going opportunities aboard giant floating blocks of flats, where turnaround speeds are closer to those of a Grand Prix pit stop. Excitement, adventure and romance replaced by crowds, queues, and a seemingly endless public address system cajoling everyone to partake in all the on board activities on offer such as rock climbing, skating, go-karting, dancing, cooking, lectures and whatever else they manage to dream up. I know that not every cruise line is heading more ‘holiday camp’ than life at sea, so we did try to see if we could recreate those ‘good old sea days’ again. One major problem was that hardly anyone involved with shipping today has any idea of just how life used to be in that age when every ship had its own distinct design and personality. Where day to day life was so unhurried and friendly and pressures were unheard of. So much enjoyment was derived not from being kept busy doing endless organised activities, but by just enjoying the company of fellow passengers and simply taking it easy. Relaxing on one of the ships wide open decks, with the only sound being that of the passing sea as we sail into the comforting beauty of another magnificent sunset. Well, that’s how I look back at those days, which I feel were just so much nicer than the world we live in today. Regardless of my own thoughts, I knew that to try to recreate such a sea-going experience would be almost impossible. But being impossible wasn’t an excuse to not even try. Then one day, as so often happens in life, something quite magical happened. When people order DVDs by internet or phone, we seldom know who they are, as they come from every walk of life from the poorest to the richest. Whilst talking to one such caller who wanted to order DVDs, he suddenly asked if our customers would be interested in having a cruise aboard a ship that was more like ships used to be. I was almost lost for words! 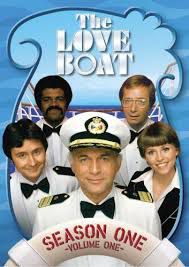 Thankfully there followed the most wonderful relationship, for this customer was the owner of none other than the ex Princess Cruises “Island Princess”, co-star of the top rated TV series “The Love Boat”. The ship, which he had renamed the “Discovery” was absolutely perfect to enable us to provide the sea-going experience so many of our thousands had been dreaming of. 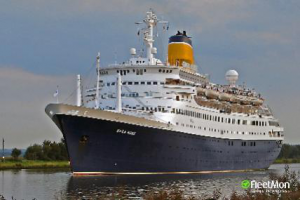 At 20,186 gross tons and accommodation for just 698 passengers, she was a far distant cry from modern cruise ships and absolutely perfect for what we wanted, and so we started Maritime Memories. As with most new ventures, you have to be careful how you stick your toe in the water. 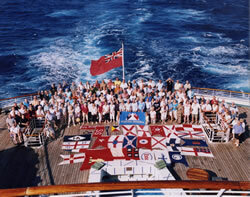 We agreed to try Maritime Memories out on a voyage from Miami to the UK via Bermuda and the Azores. With stops at two really nice places, plus all the sea days crossing the Atlantic, it was an absolutely perfect voyage for us. We were very concerned of course, worried whether this type of cruise would appeal to the ship enthusiast, whether different ranks amongst ex-seafarers would mix and perhaps top of the list, would wives and partners of these ship interest people enjoy themselves too. We needn’t have worried however, for right from the very start they all felt at one with the ship and all aboard. The Captain and crew treated us all with such enthusiasm, allowing us to spend time on the bridge when at sea. The Chief Engineer even welcomed us to his engine room and personally showed us all round. We had our special dinners, which were prepared by our Chef from menus once used aboard some of the world’s most famous ocean liners such as the Queen Mary, Normandie, Queen of Bermuda, Caronia, Pendennis Castle, Arcadia, Himalaya and Highland Monarch to name but a few. We also had our own Maritime lectures, screenings of rare maritime films, our own cabaret evenings and even an end of voyage Fancy Dress Dinner and Dance. It really was as close as we could get to being a voyage as experienced in that Golden Age of Ocean Travel. Since that first cruise we have taken thousands of people all over the world and in all that time have, as far as I can recall had just one single complaint. But then no matter what you do, there will always be someone who doesn’t like it. 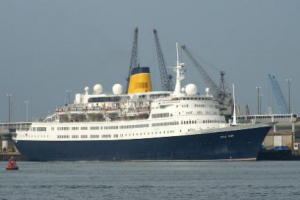 We have also been approached by other shipping companies to use them for Maritime Memory Cruises, companies such as Saga, using their Saga Rose, Saga Ruby, Saga Sapphire and Saga Pearl 11. 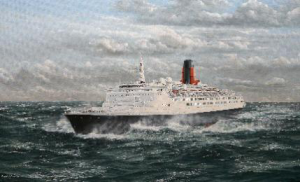 Voyages to Antiquity aboard their lovely ship the Aegean Odyssey and Cunard’s “QE2”. Special times that we will always treasure amongst our fondest memories. 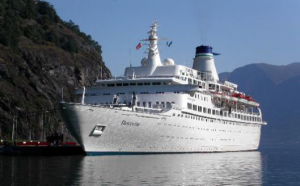 Now we are moving on to bring you new Maritime Memory cruises/voyages. 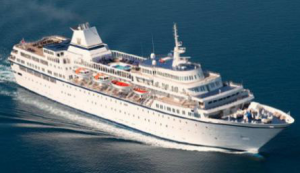 I, Des, prefer to call them voyages, because they offer and give so much more than the regular cruises. As well as all the facilities and entertainment the ship provides, we provide free of any charge, all our Maritime Memories fun and entertainment as well, including the special dinners, film shows, lectures, cocktail parties and farewell dinners. But you know, the thing that brings the most happiness to these unique cruises is you! Yes, truly, for to be on a beautiful ship with such a great crowd of fellow passengers is just so enjoyable. Especially in this day and age of computers, iPhones and iPads and all those other things that have taken so much away from real person to person contact, to be with so many like minded people really is a worthwhile experience on its own. In addition, being small, we can get into fantastic ports of call and those out of away places that modern cruise ships are far too big to encroach on. We are the only people in the world who operate these unique cruises/ voyages. If you’d like to be kept up-to-date with all the latest information on what we are planning, sign up for our newsletter so you can get in quick and get the pick of what’s on offer. So, if you like ships for whatever reason and want to enjoy a special sailing with us, then just contact us for an up-to-date brochure or to ask any questions. We would be delighted to hear from you.